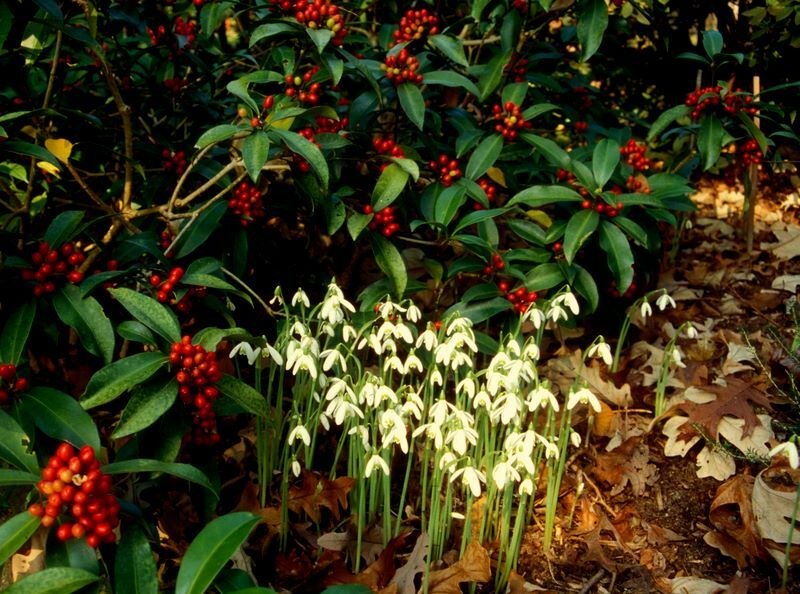 You will all want to rush to your nearest purveyor of elegant magazines—Barnes and Noble in our area—and pick up the current issue (February 2016) of Fine Gardening. 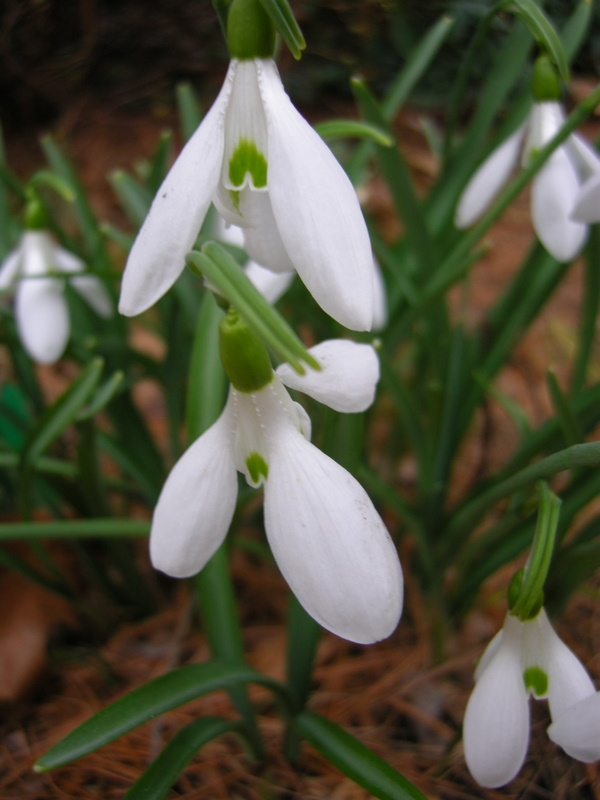 I wrote the cover article, “Snowdrops: Start spring with these easy care varieties.” It features a lot of useful information about snowdrops especially for gardeners wanting to expand beyond the common snowdrop. 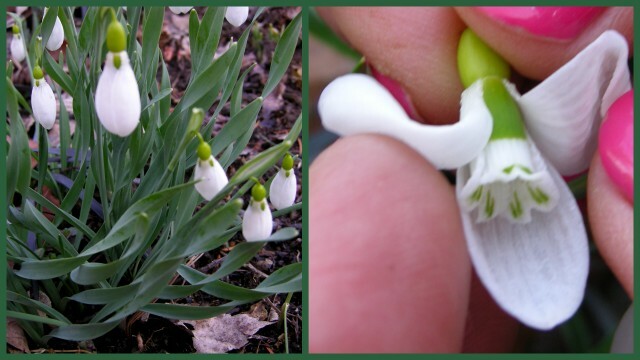 Four of the photos are also mine, and there are two lovely shots of my hands :-). 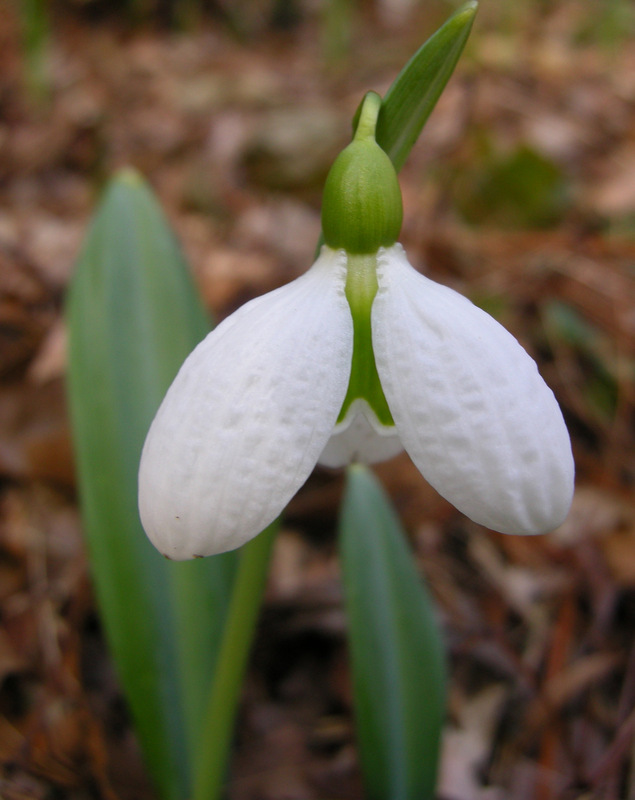 My photo of the giant snowdrop illustrates one of their greatest charms: their early bloom time. Shown here boring holes through the ice on Valentine’s Day 2011. 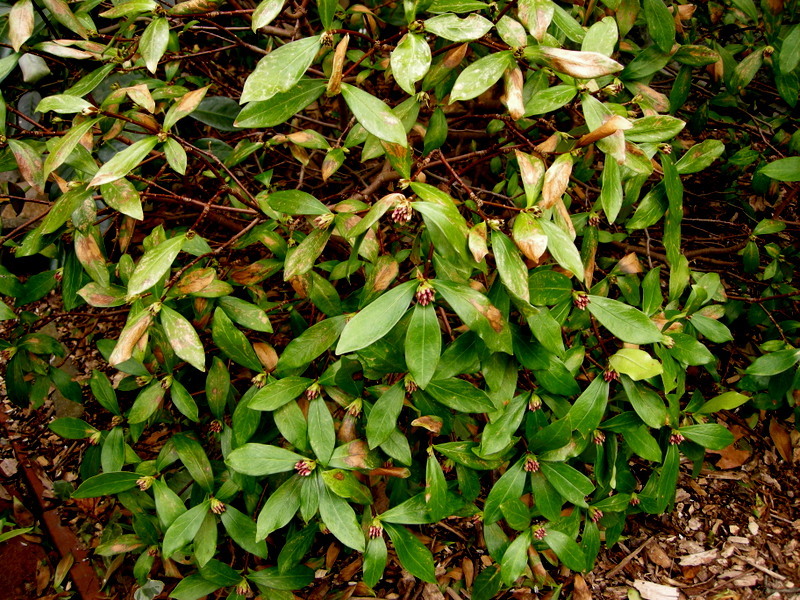 My photo of ‘Magnet’ illustrates how quickly the more vigorous varieties can multiply to form eye-catching masses in your garden. My other photos are of ‘Lady Elphinstone’ and ‘Blewbury Tart’, but you will have to read the article to see those. Please let me know what you think and ask me any questions that the article raises by typing a comment in the “Leave a Reply” box at the very end of this post. 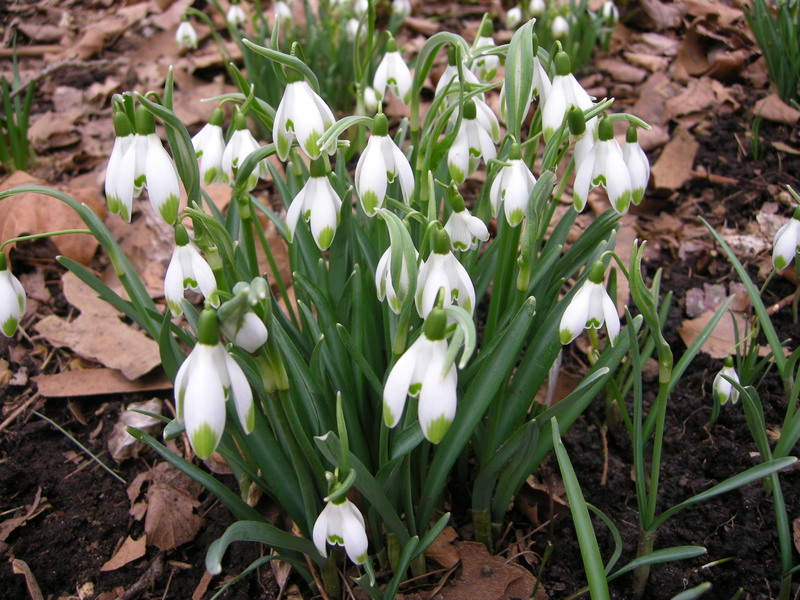 Nursery Happenings: To access the 2016 Snowdrop Catalogue, click here. 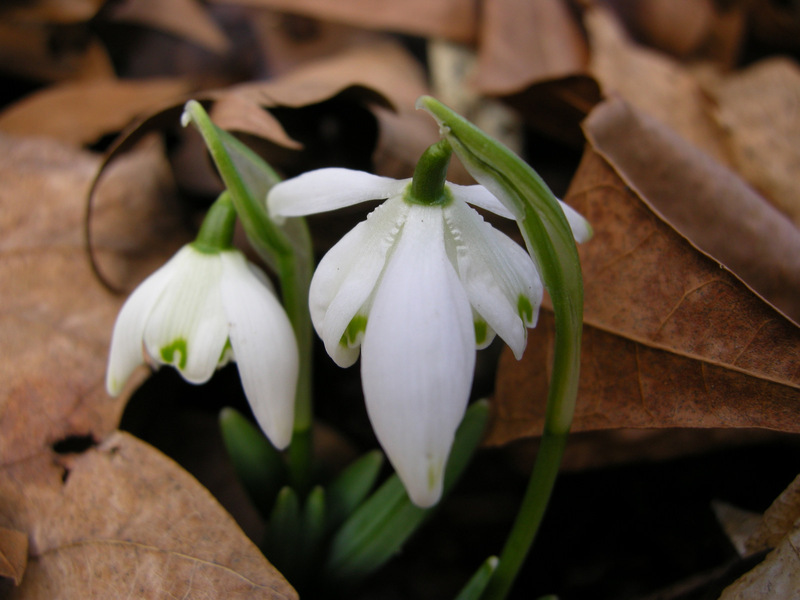 You can sign up to receive catalogues and emails about nursery events by sending your full name and phone number to carolynsshadegardens@verizon.net. Subscribing to my blog does not sign you up to receive this information. 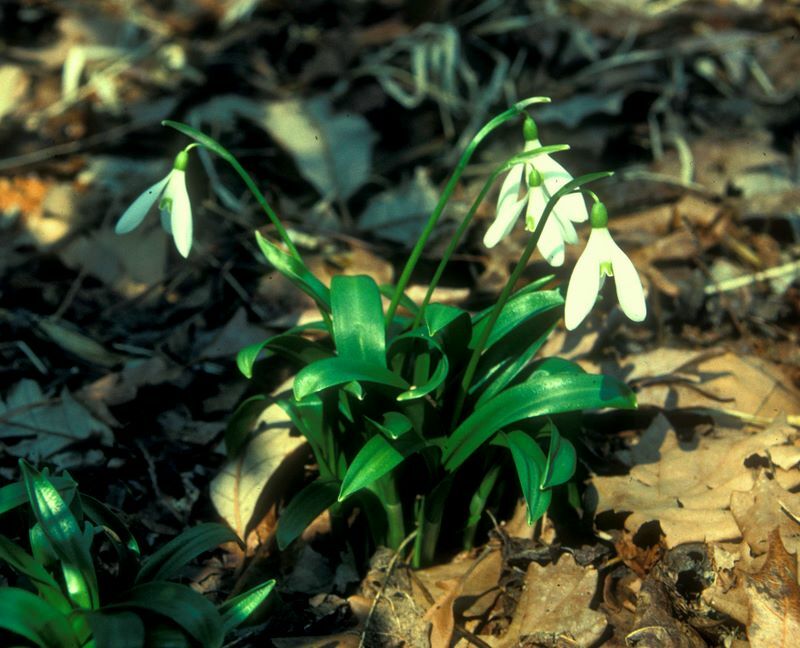 The BBC News Magazine was hours away from publication when they emailed to request a photo of me with snowdrops. My husband and I had a quick photo shoot and this is what we came up with. 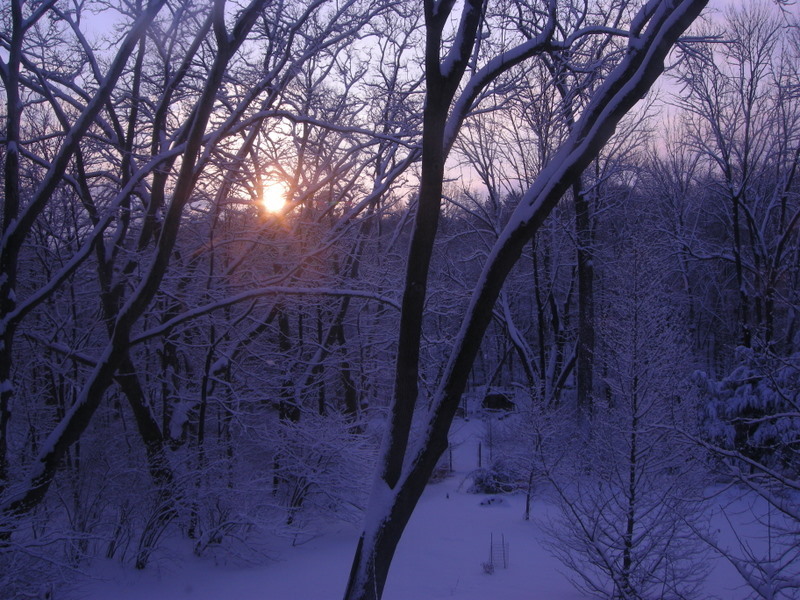 We interrupt the regularly scheduled flow of posts on this blog with breaking news. 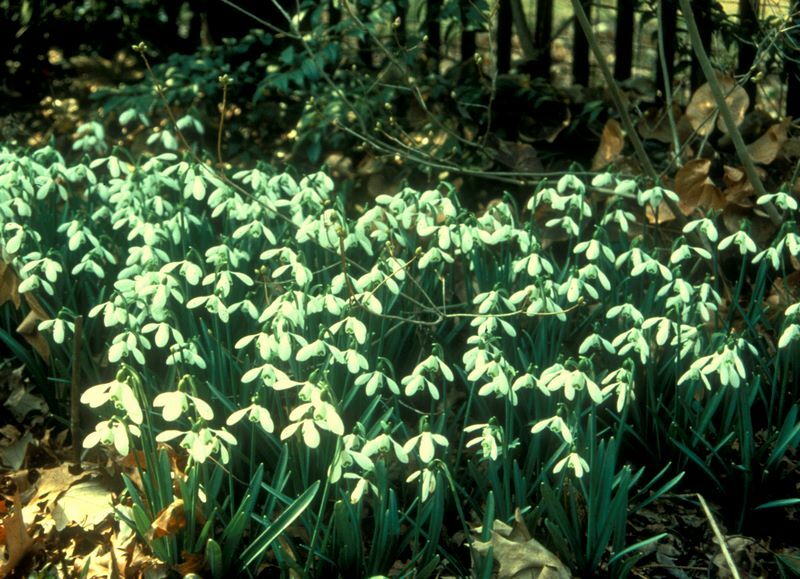 The owner of Carolyn’s Shade Gardens is prominently featured in the BBC News Magazine lead article for February 2 entitled “Snowdrop Fanciers and Their Mania”. All kidding aside, I couldn’t be more thrilled. 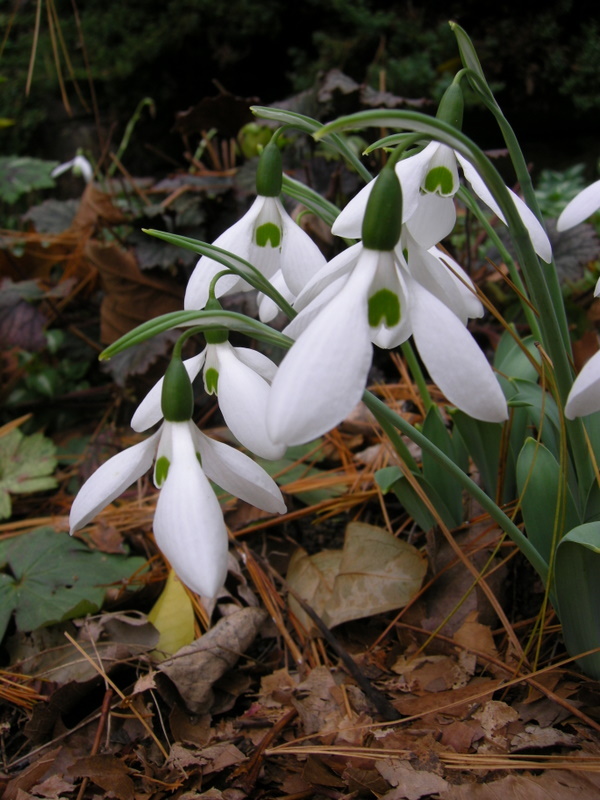 I am in the company of Matt Bishop and John Grimshaw, two of the authors of the “snowdrop bible” Snowdrops: A Monograph of Cultivated Galanthus, and Chris Ireland-Jones, the owner of the famous English snowdrop nursery Avon Bulbs. 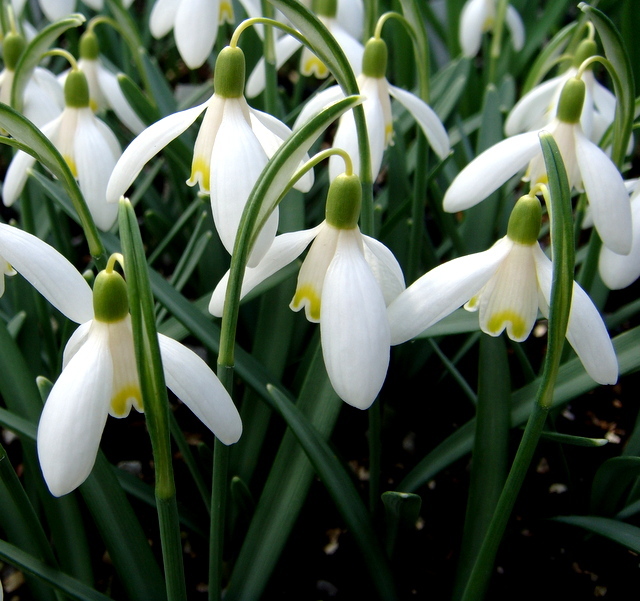 You know what a snowdrop fanatic I am so this is the ultimate compliment. 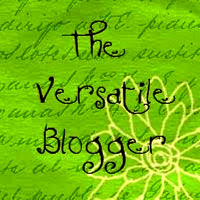 To read the article (I am in the second half), click here. 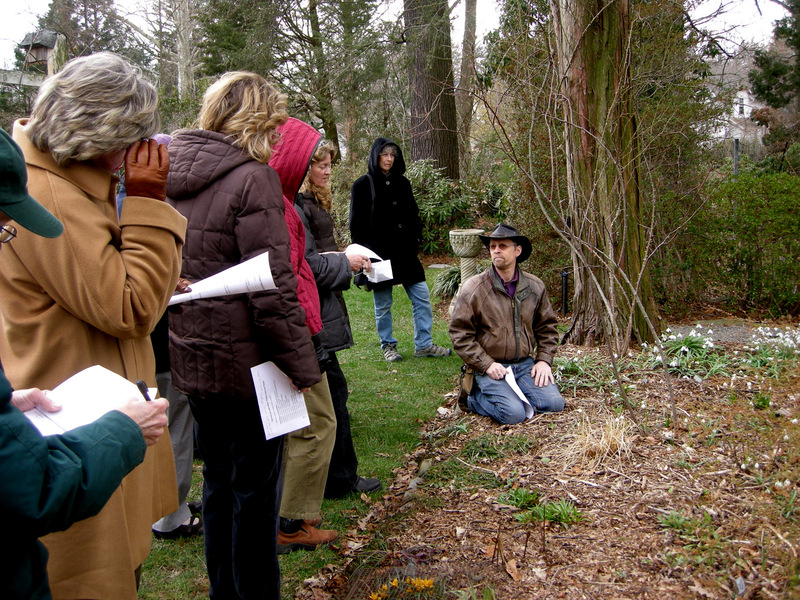 Charles Cresson pointing out some of his very unusual snowdrop cultivars to last year’s seminar attendees. 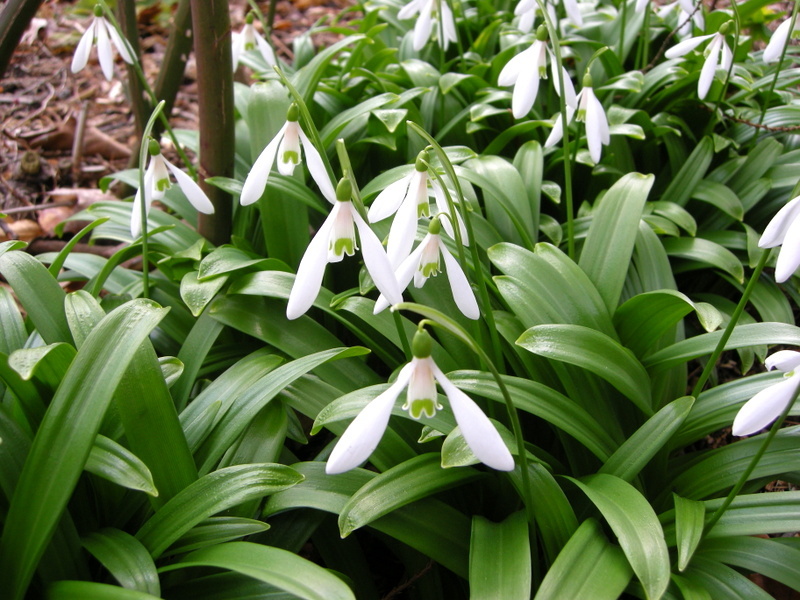 I am very excited that winter interest plant expert and gardener extraordinaire Charles Cresson has agreed once again to give seminars on Snowdrops and Other Winter Interest Plants just for my customers. 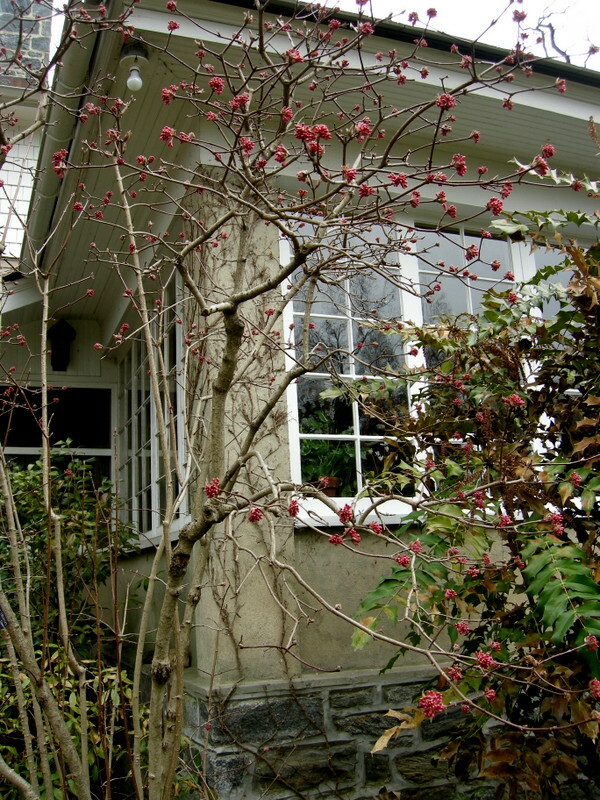 The seminars will be limited to 20 people each and will take place in his amazing Swarthmore garden, Hedgleigh Spring. The brochure telling you the details and how to sign up is here. If you are a local gardener and interested in attending, I encourage you to email immediately because I expect these seminars to sell out. 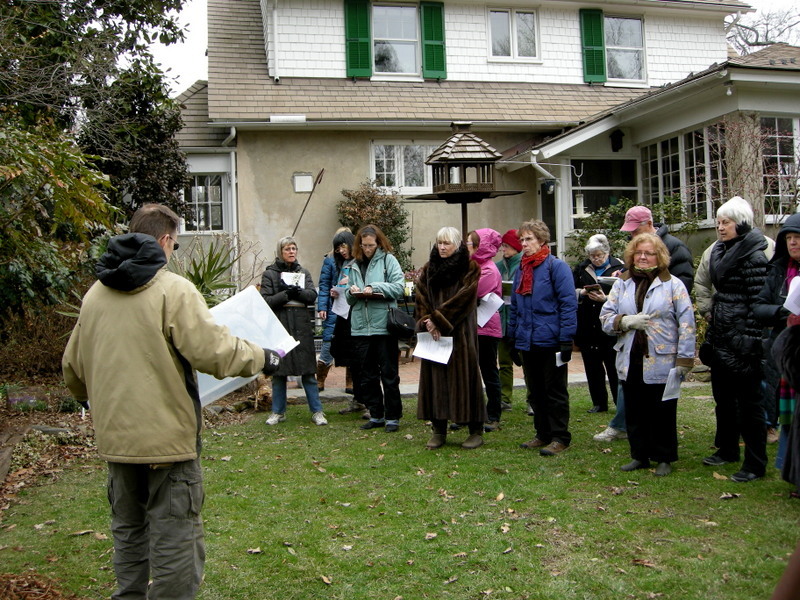 For a complete description of the 2011 seminars with many photos, click here. 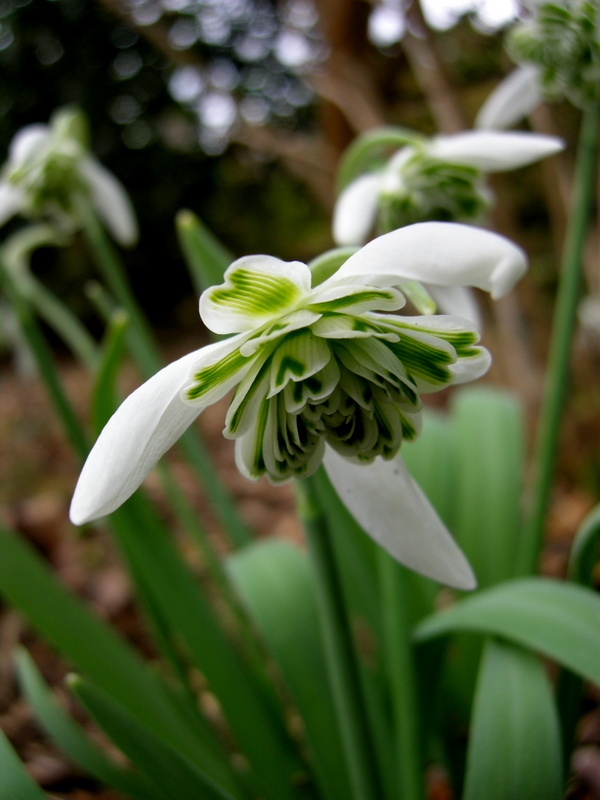 The very first snowdrop cultivar to open in my garden in 2012: ‘Kite’. 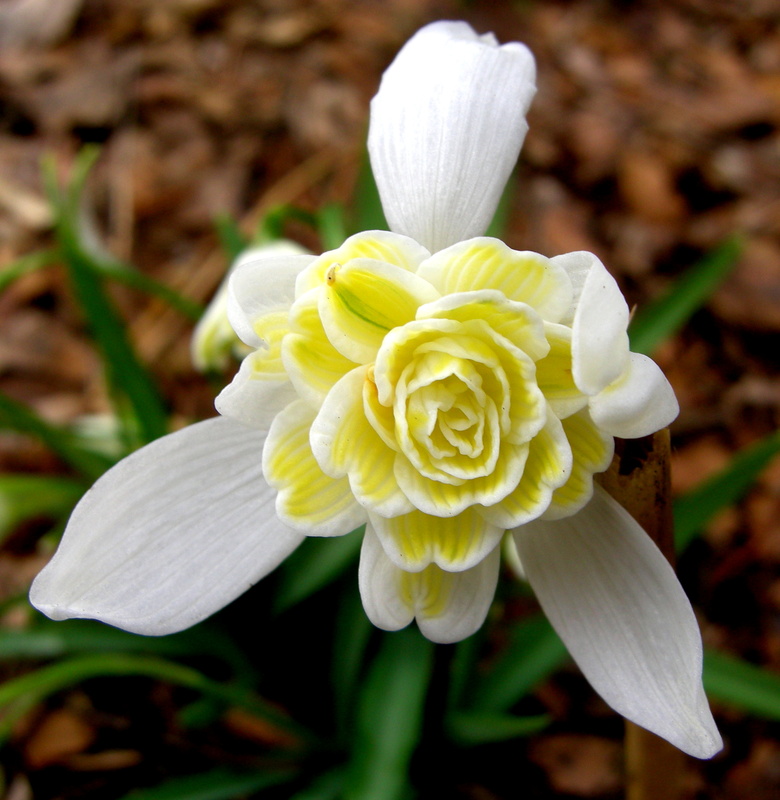 Notice the very long outer segments (petals). 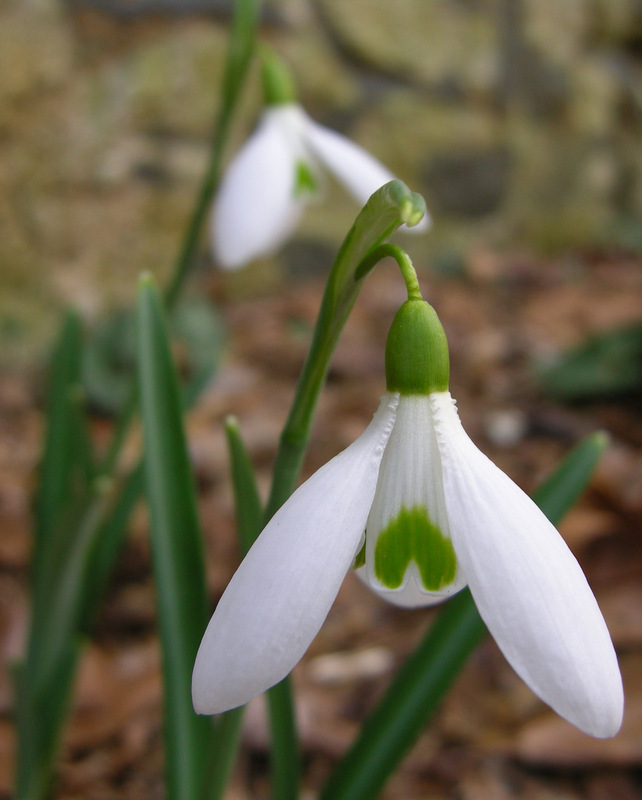 Second to open was Galanthus plicatus ‘Augustus’ with its striking puffy rounded and quilted outer segments. 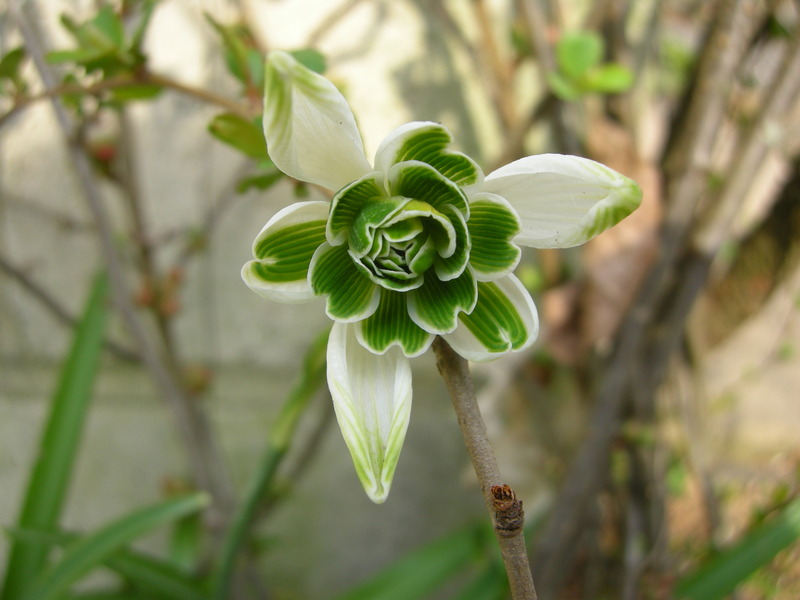 ‘Magnet’ is open and swaying in the breeze on its unusually long and thin flower stems (pedicels). 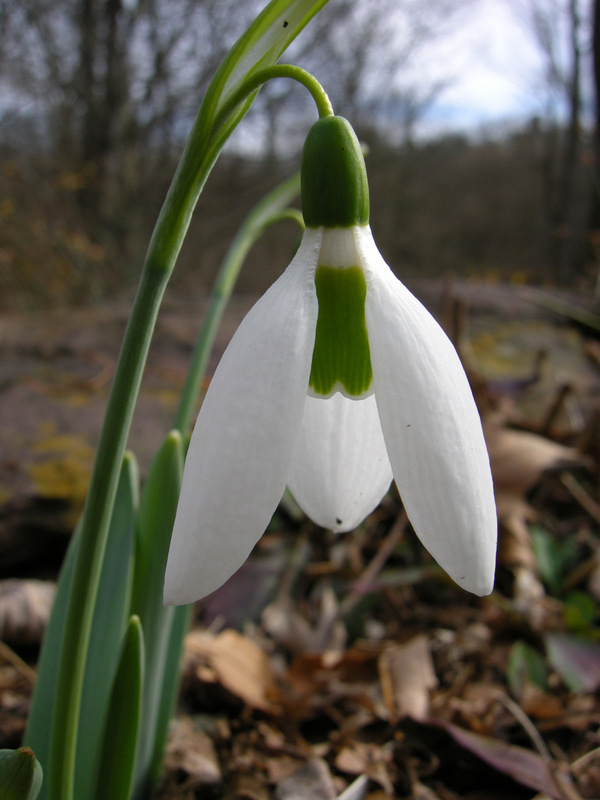 The double common snowdrop ‘Flore Pleno’ is blooming even though it is usually one of the last snowdrops to open in the middle to end of March. 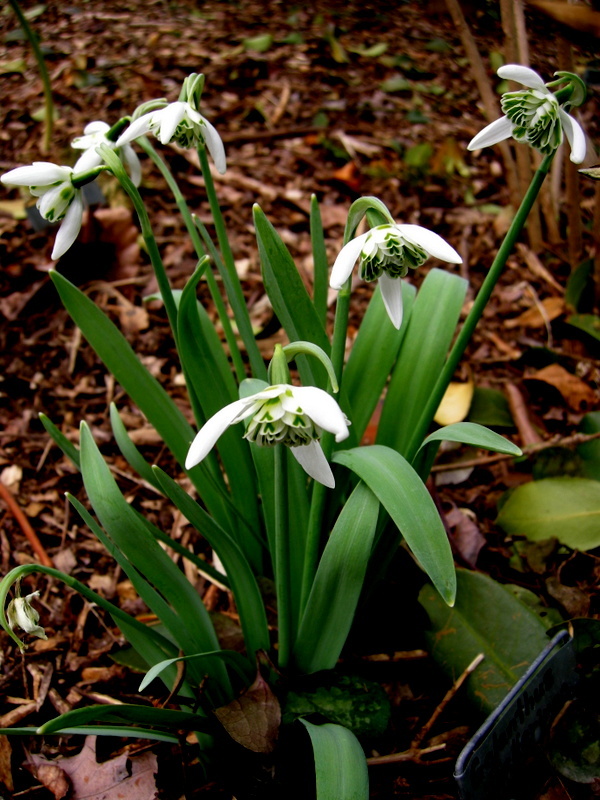 The aristocratic snowdrop ‘Atkinsii’, said to resemble the pearl drop earrings of Elizabeth I, is also flowering. 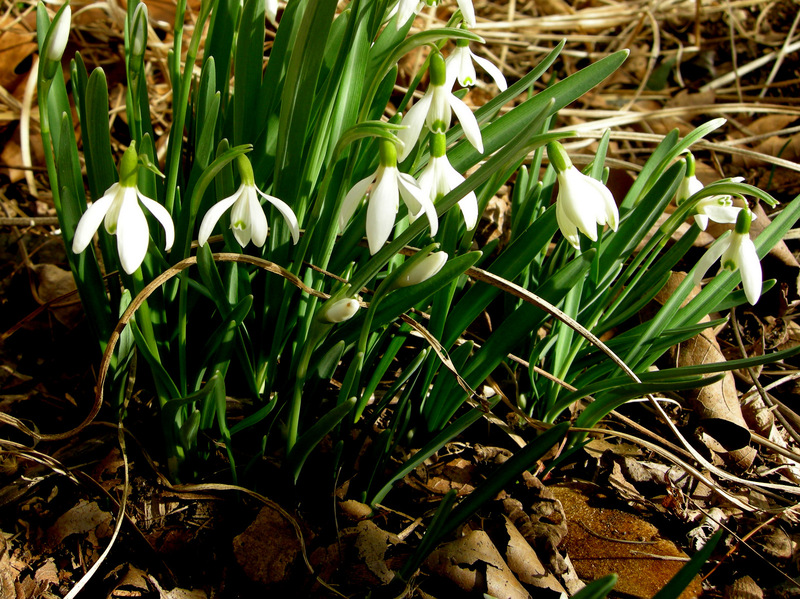 The common snowdrop, G. nivalis, is blooming a few weeks early. I shot this picture to document the date they opened and had a funny feeling that something wasn’t right. When I uploaded the photos to the computer I realized the plants in the front have four outer segments instead of three—very interesting. 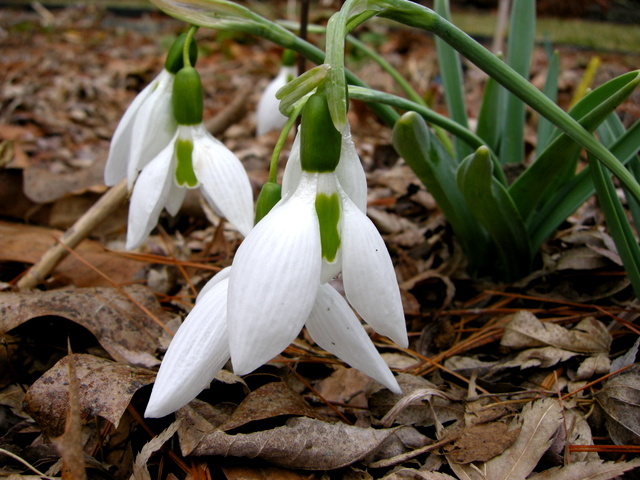 The giant snowdrop, G. elwesii, has been flowering on and off since November, but this patch just opened this week. 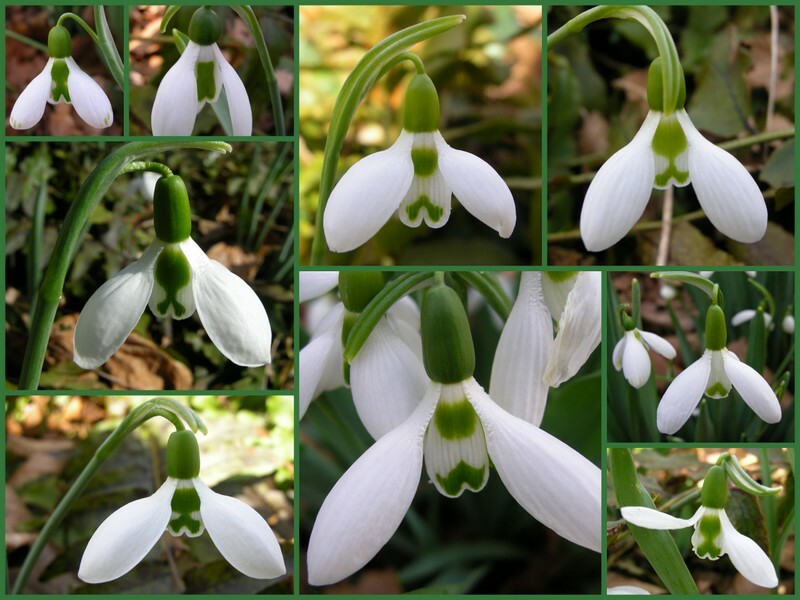 Every flower in this collage is the same species, G. elwesii, and yet the green marks on the inner segments are all different, from the small single green mark on the middle right flower to the mark that looks like a mustache and eyes in the middle of the bottom row. 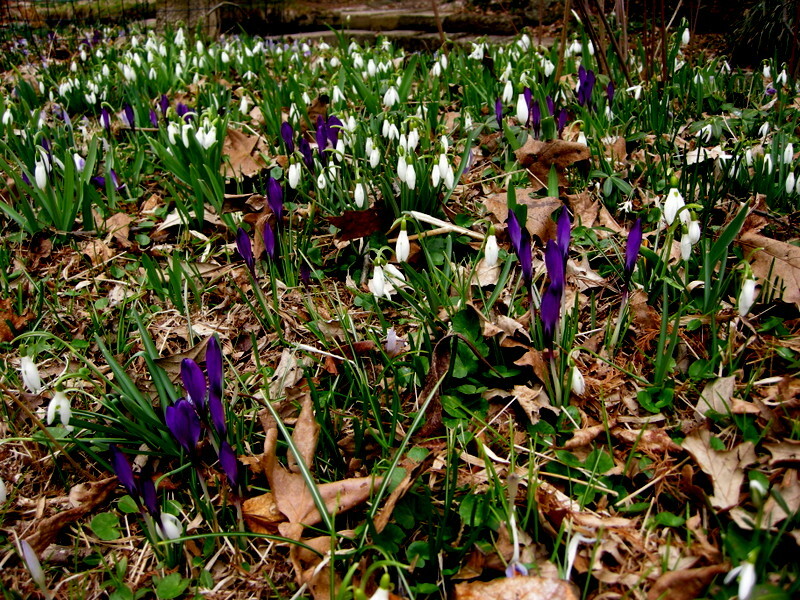 Although I realize this will not excite most gardeners, at least everyone can see the amazing variety. And variety is the spice of life. Graphicality–UK: Helene is a very accomplished author. 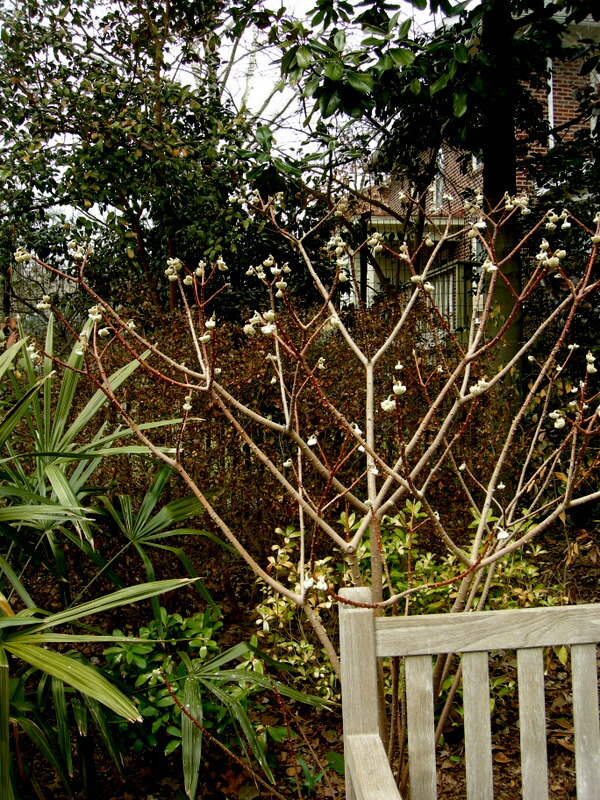 You might want to check out her recent post on the book she published with her lovely photos of Kew Gardens. Her current post talks about US grey squirrels invading Britain. 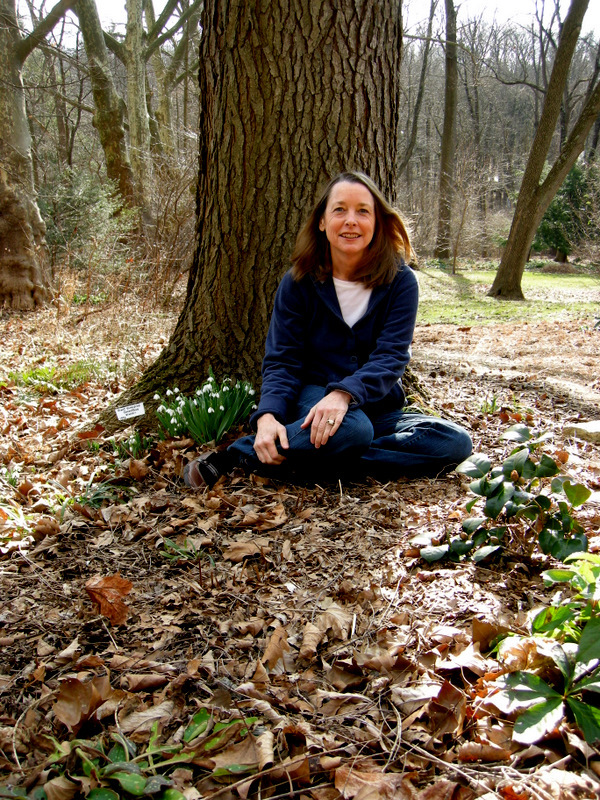 Green Place: Sheila is in Chapel Hill, NC, and reflects on spirituality, nature and gardening. She and I also share a love of Maine islands. 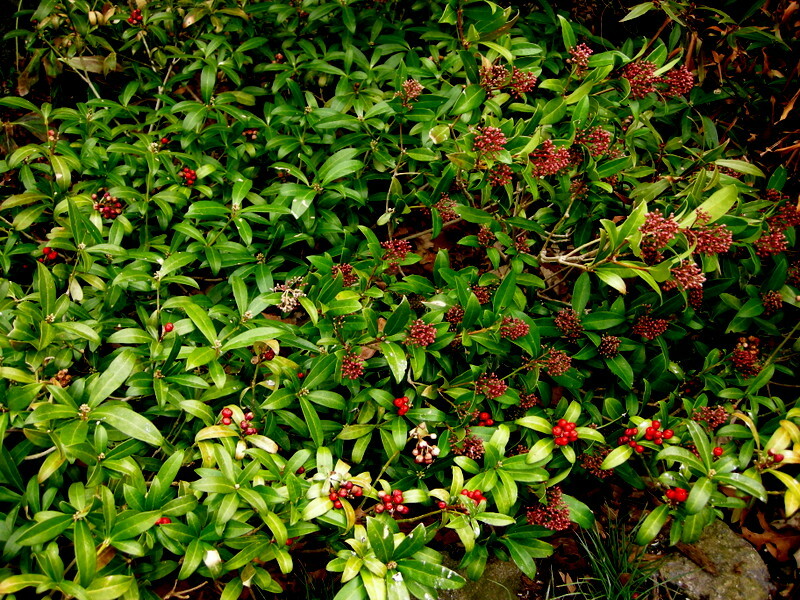 The Amateur Weeder: For a very different perspective, Lyn gardens in Australia and her blog produces “seedlings from the mind of an inconstant gardener.” I particularly liked her recent post called Designed by Nature. 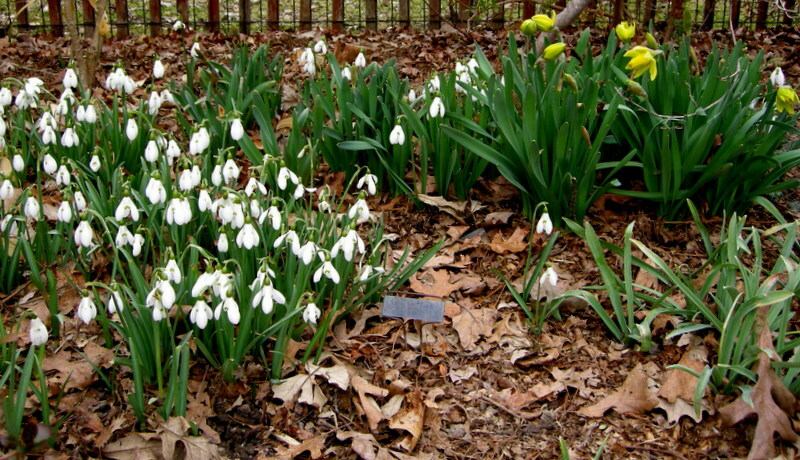 Women and the Garden: Patty writes about “the history of the garden and the various roles women played in that history,” and it is all absolutely fascinating. She doesn’t post often, but when she does you don’t want to miss it. 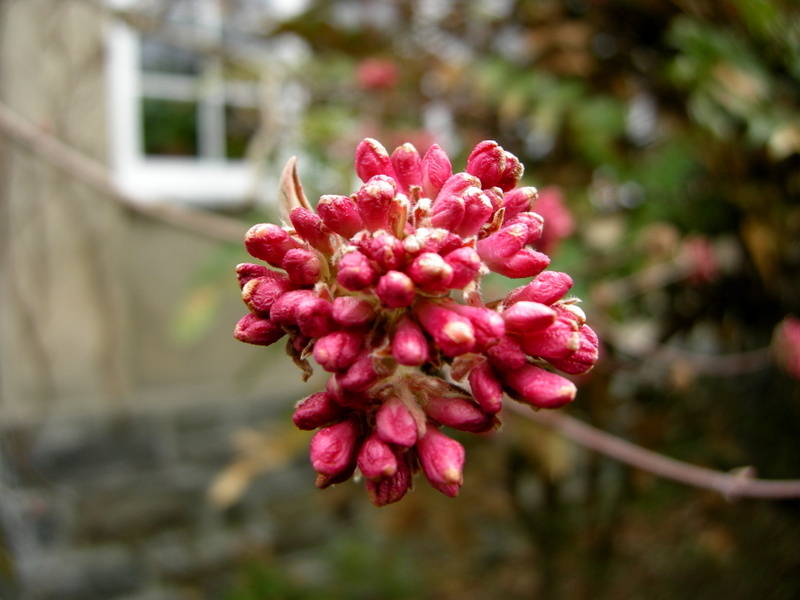 Her latest post is on Pomona, the roman goddess of fruiting trees and orchards. Calendar: If you would like to look at my photos all year round, please consider buying my 2012 calendar, available worldwide, 20% off through 2/5/12. For details, click here. 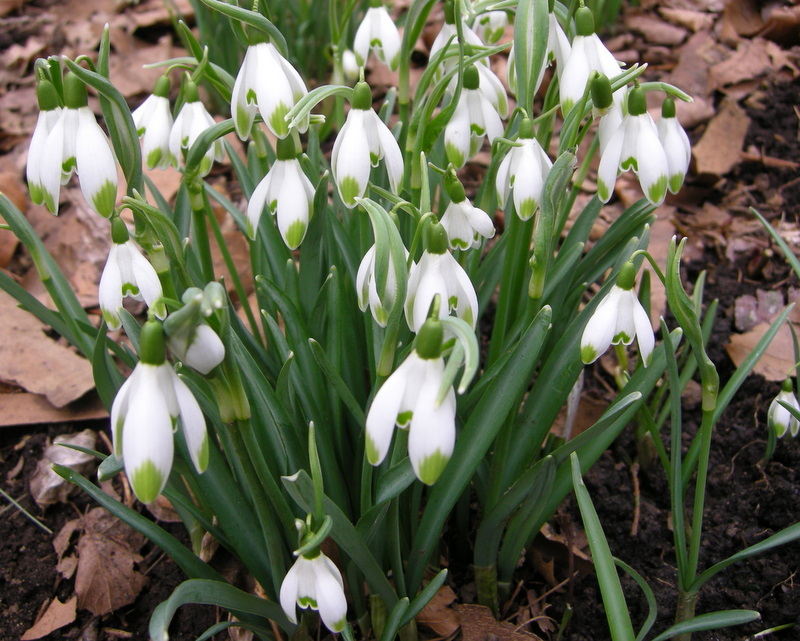 Nursery Happenings: To view the 2012 Snowdrop Catalogue, click here. 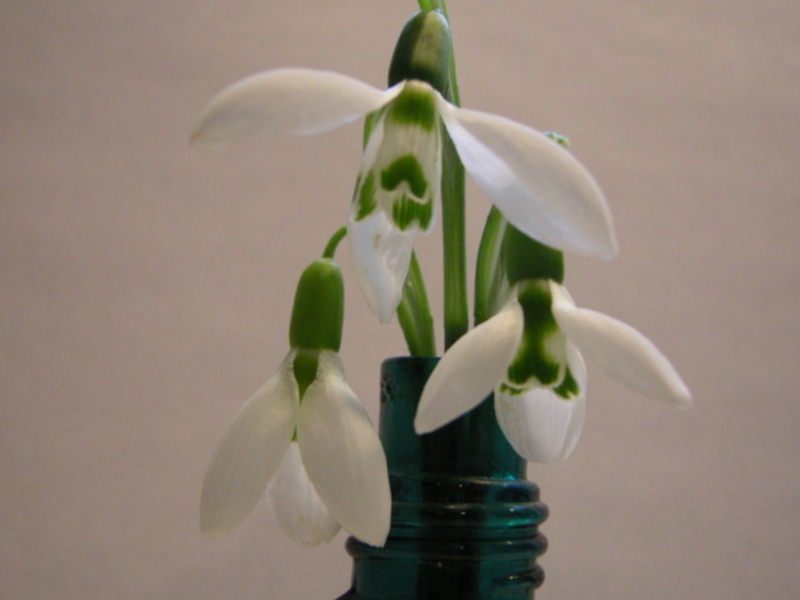 I am currently accepting orders—snowdrops are available mail order. 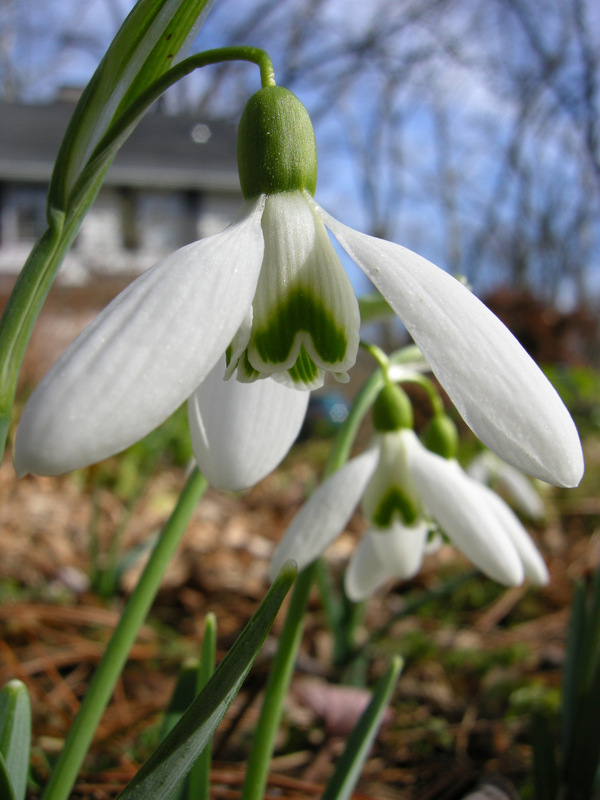 The Snowdrops and Other Winter Interest Plant Seminars are also available for registration here. The Friday seminar has one space left, and there are three spaces on Monday. 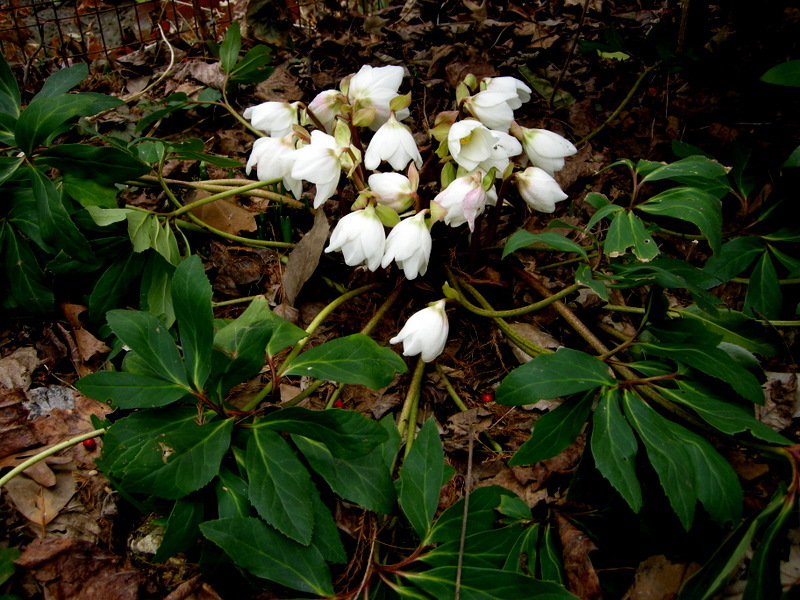 Look for an exciting new hellebore offering in February 2012. 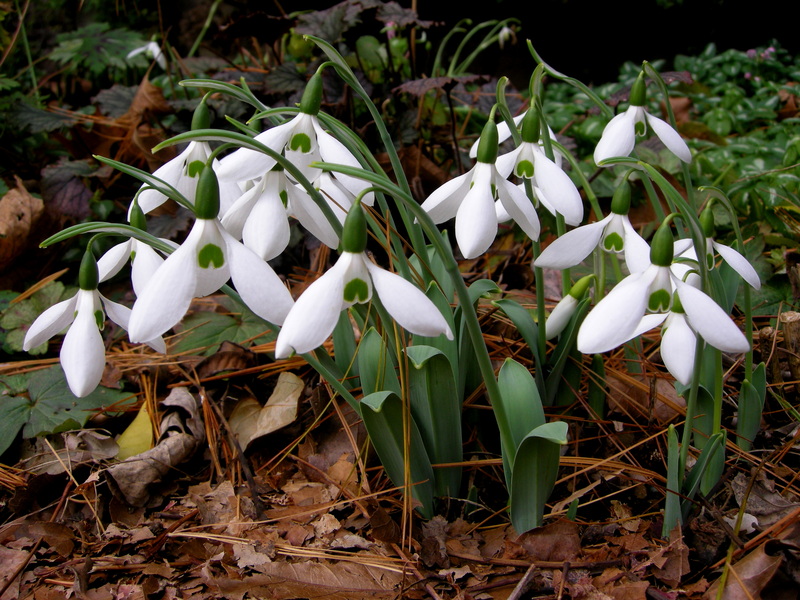 I have always loved snowdrops. I loved them so much that I set my seasonal clock by them. 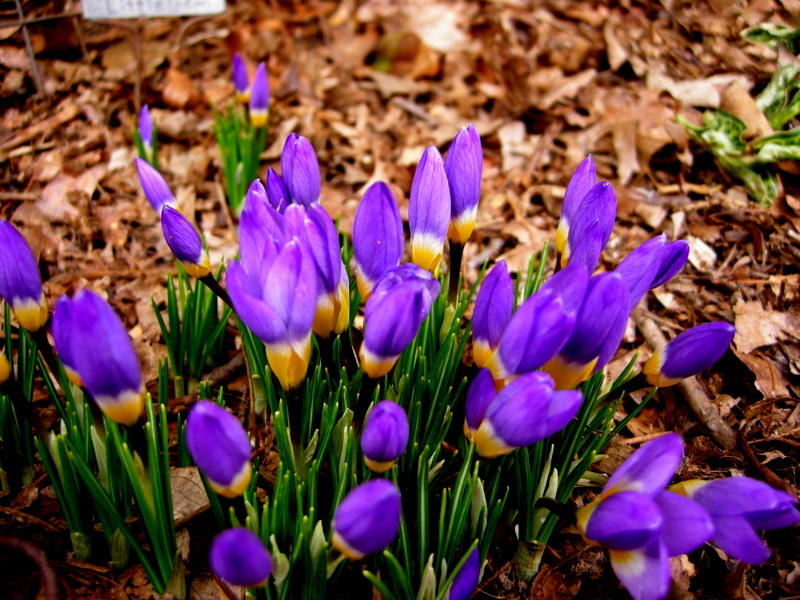 When they bloomed, it was spring no matter what the calendar said. 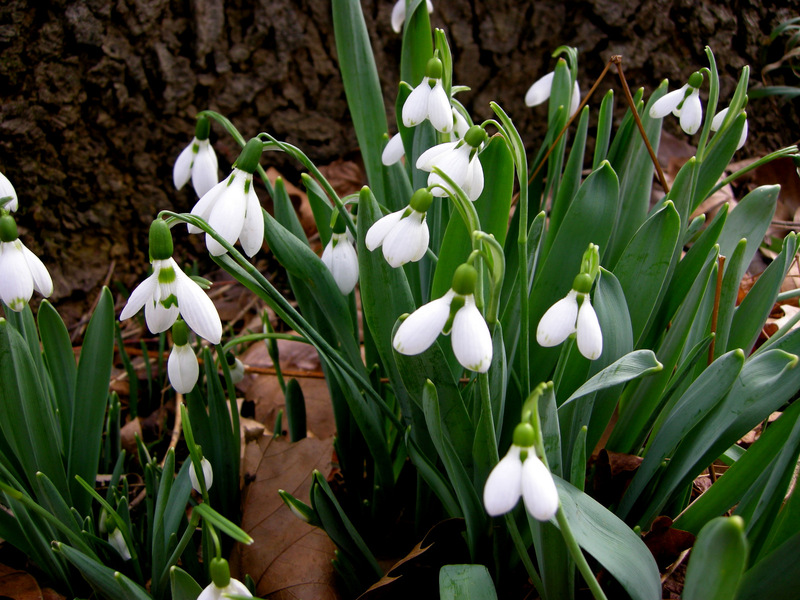 When we purchased our property in 1983, it came with thousands of common snowdrops, Galanthus nivalis. 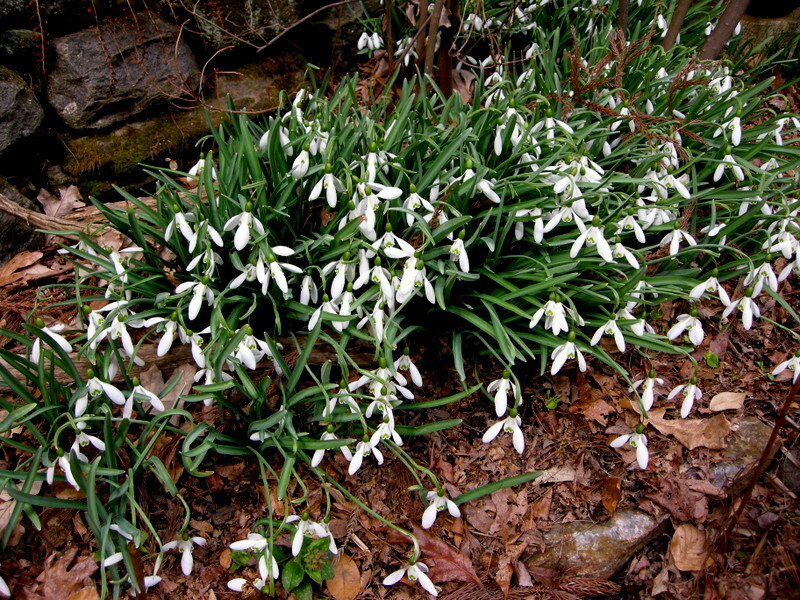 Many of my original snowdrops are on an open south-facing hill and often start to bloom at the beginning of February. 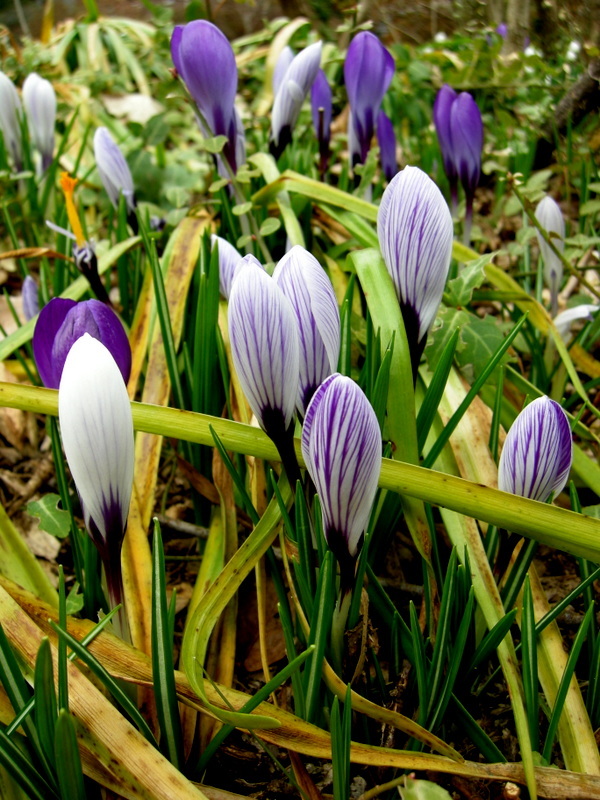 That’s when spring began for me. 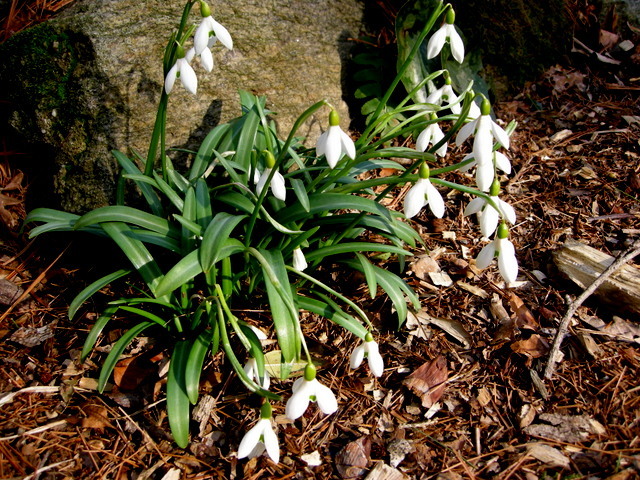 When they bloomed, I would put on my warmest set of work clothes, head out to the garden, and leave the winter doldrums behind. That was before I became a galanthophile, a British word describing gardeners obsessed with snowdrops. 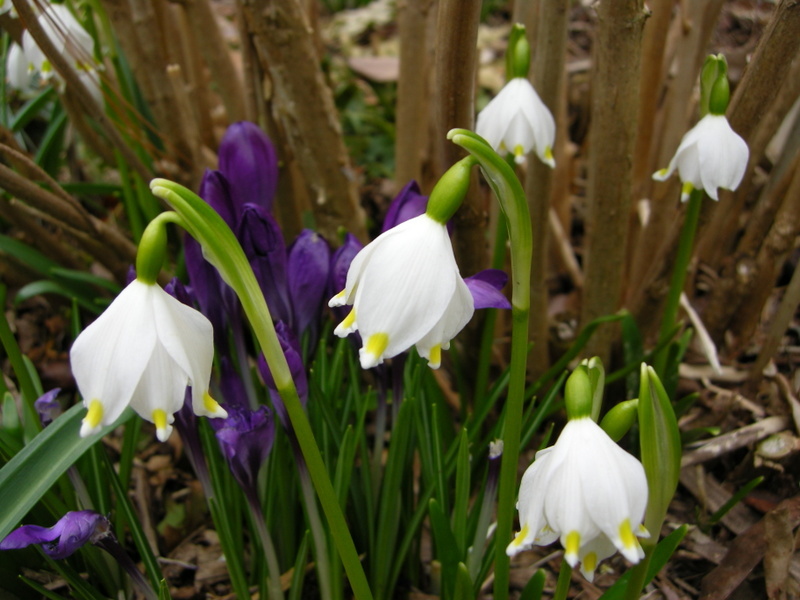 In my pre-galanthophile days, I thought (and I shudder to put this in writing) that once you had the double ‘Flore Pleno’, and the giant G. elwesii, and the green-tipped ‘Viridi-apice’, and the glossy green-leafed G. woronowii, you pretty much had the snowdrop field covered. The rest all looked the same, didn’t they? What were all those collectors getting so excited about? 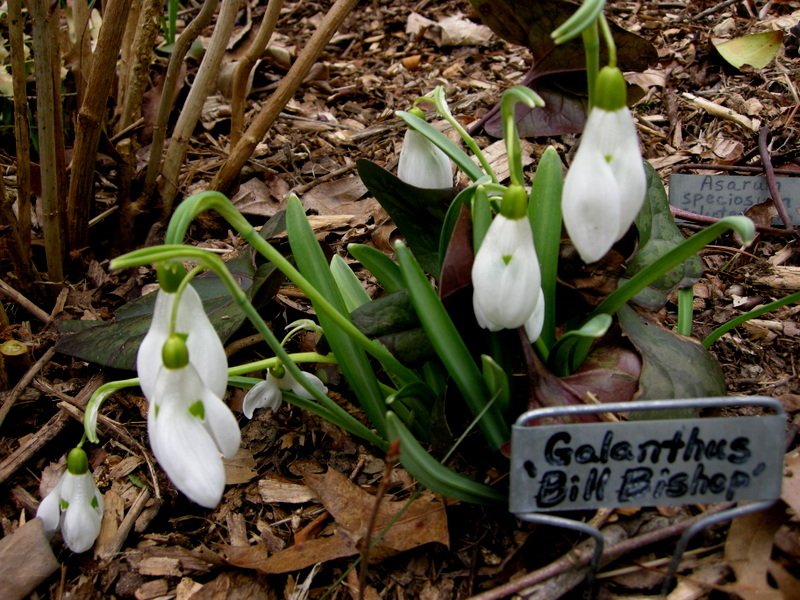 But one day, I realized the error of my ways and was seized by the galanthophile obsession to collect every snowdrop cultivar I could get my hands on. Actually, it didn’t really happen in a day—more like years. 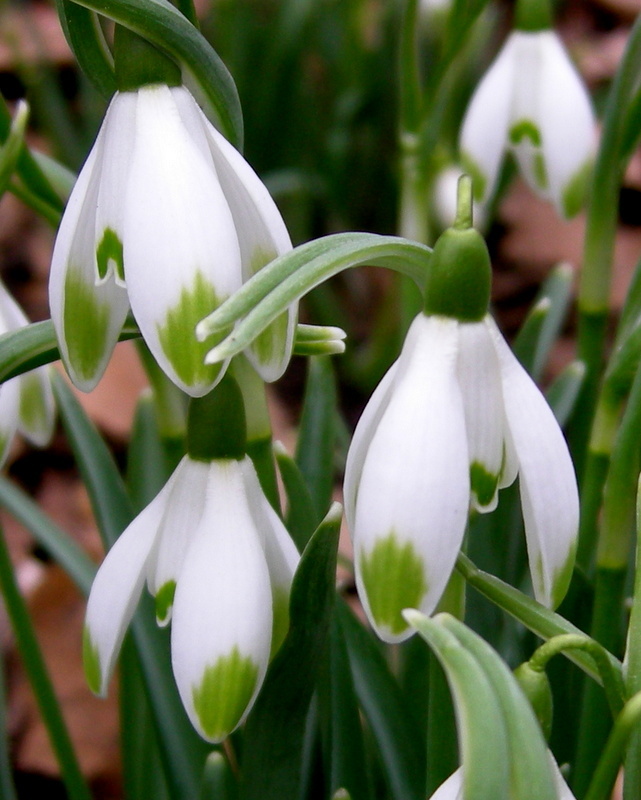 It started with reading the snowdrop sections in the (old) Heronswood catalogues. 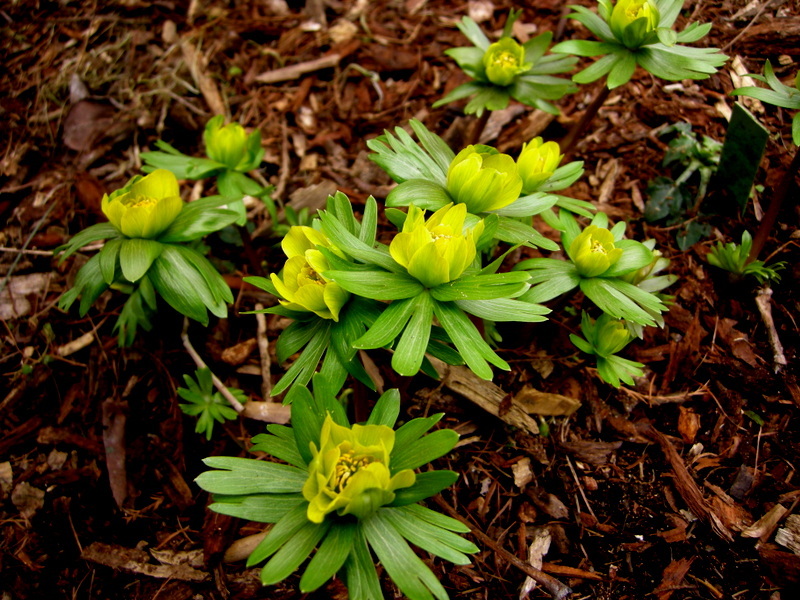 Dan Hinkley was a master at plant descriptions, and I ordered a few new cultivars each year. 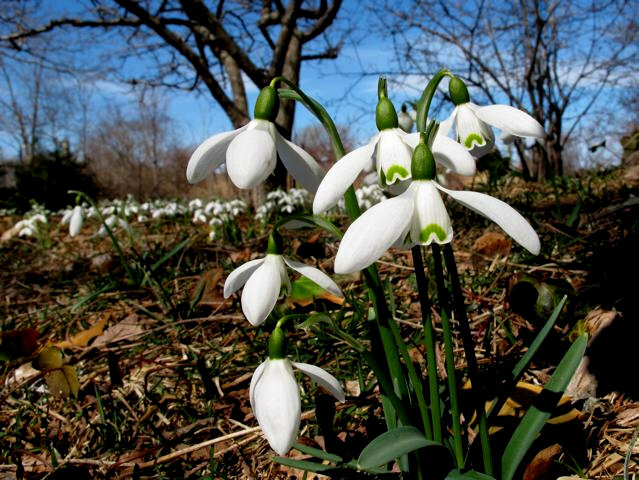 However, my fate as a galanthophile was sealed when I visited the garden of famous regional plantsman Charles Cresson during snowdrop season. 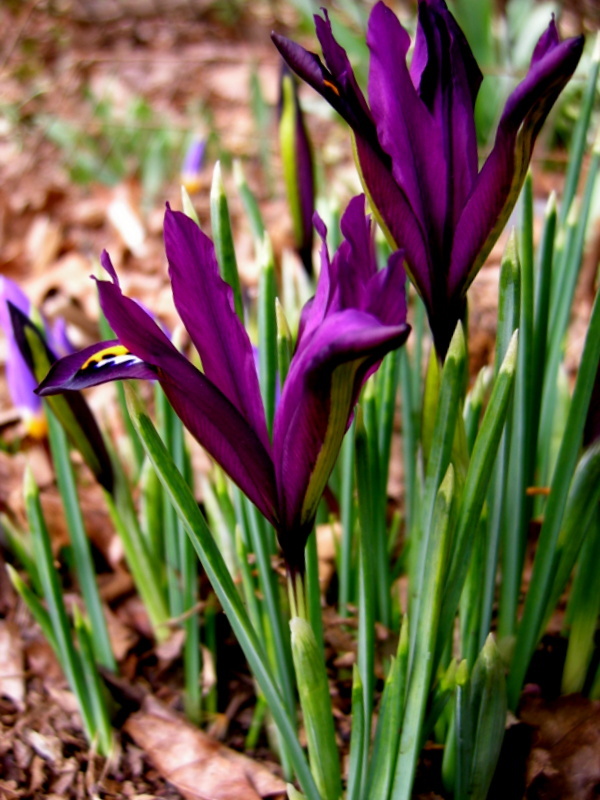 Charles can make you see and appreciate the finest distinctions in plants, and he is so generous with his treasures. Now I had the wild up-facing double ‘Blewbury Tart’, and ‘Magnet’ with the fishing line stem, and the drop-pearl earring shaped ‘Atkinsii’, and the classic ‘S. 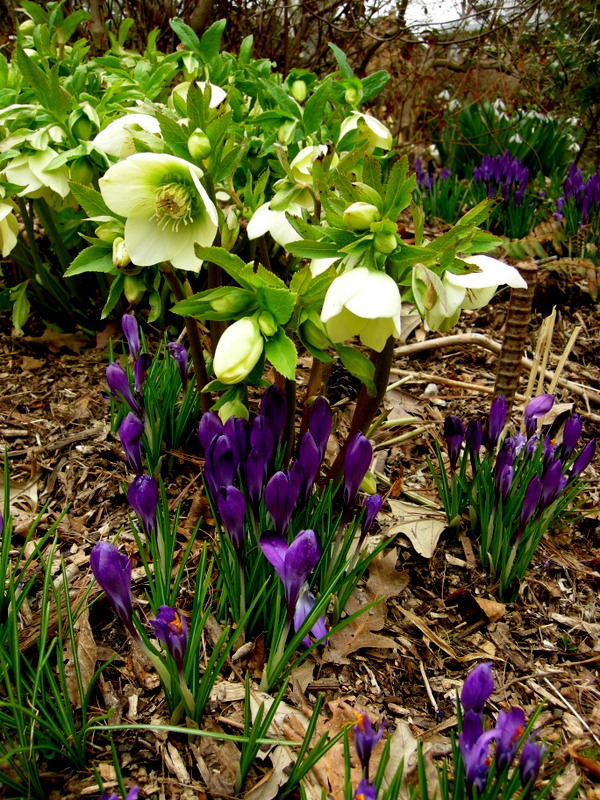 Arnott’, and the rabbit-eared ‘Sharlockii’, and …. they all looked different to me. I only have 25 varieties though, hardly qualifying me to join the International Galanthophile Society if there is one. 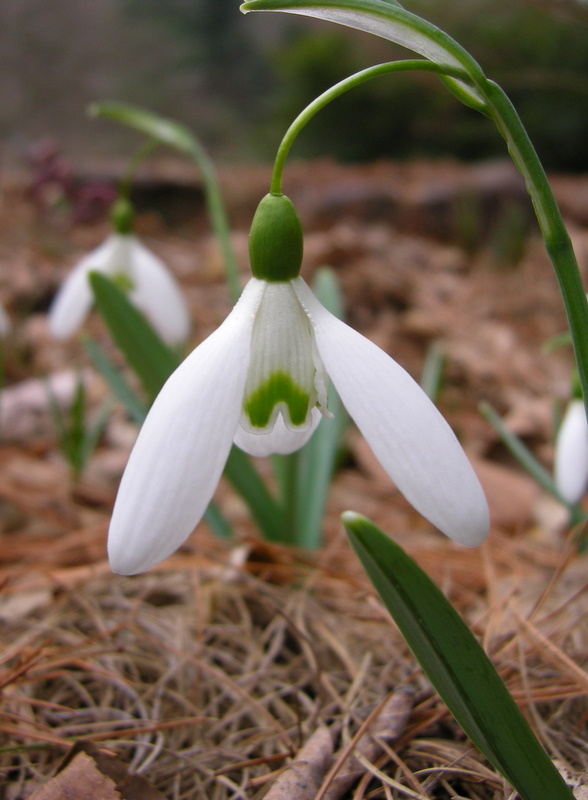 Luckily (or unluckily) unusual snowdrops are rarely offered for sale in the U.S. saving me from creating a system to keep track of hundreds of snowdrop cultivars in my garden. 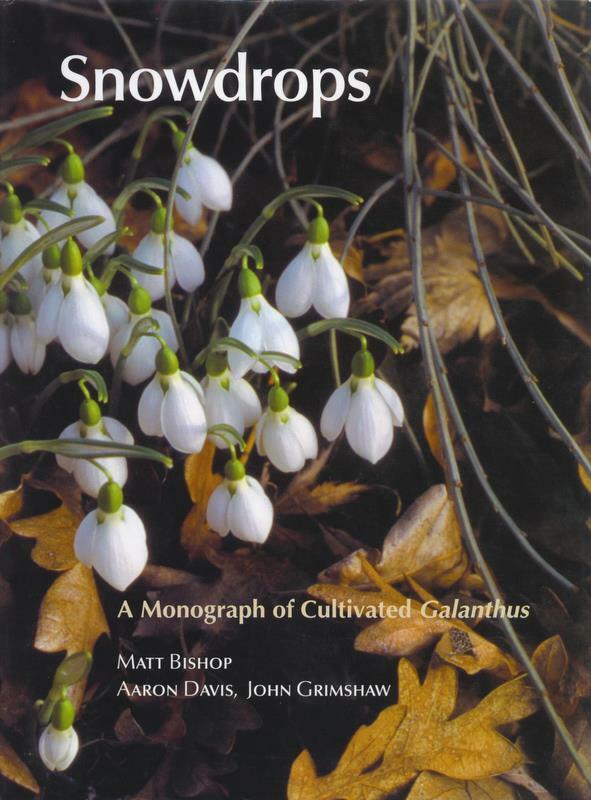 The British snowdrop “bible”, Snowdrops: A Monograph of Cultivated Galanthus by Matt Bishop, et al., describes 500 cultivars and is sadly out-of-date number-wise. 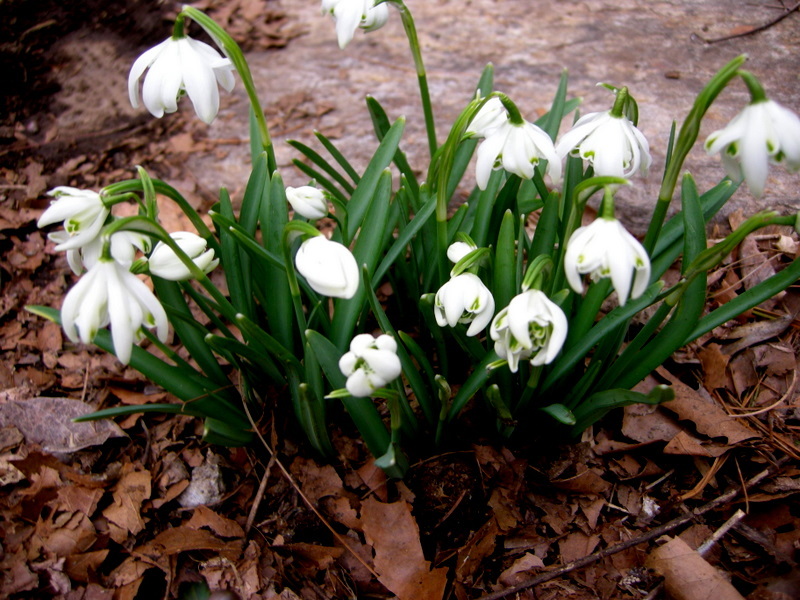 But why am I talking about snowdrops in fall? 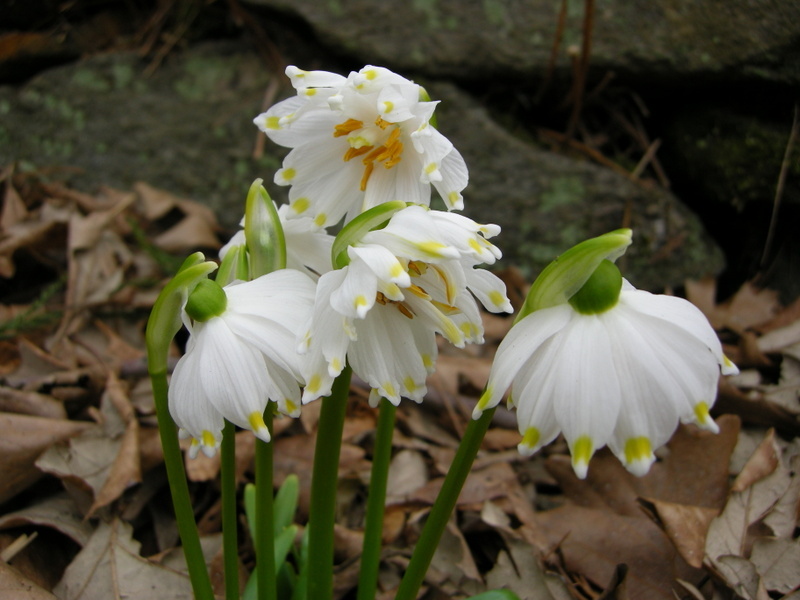 Because two of the unusual varieties I have been able to collect bloom in fall. 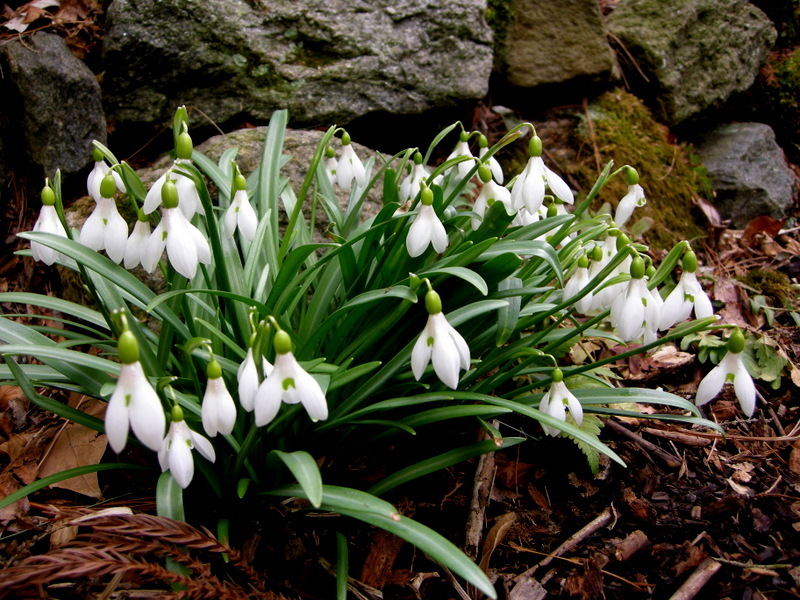 This wreaked havoc with my “start of spring” clock, which I had to reset to recognize the wonderful fragrance of sweet box as the beginning of spring. 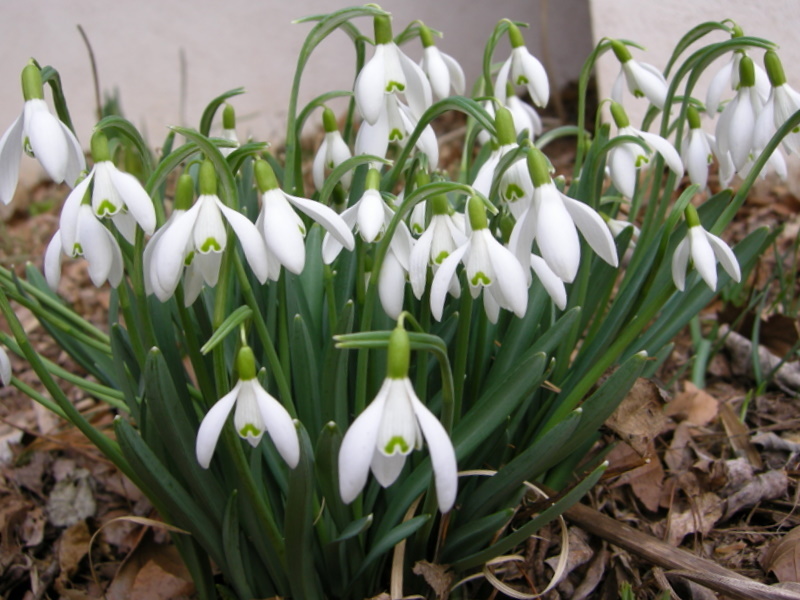 But this inconvenience has been more than outweighed by allowing me to start my snowdrop season in early October with the blooming of Galanthus reginae-olgae. 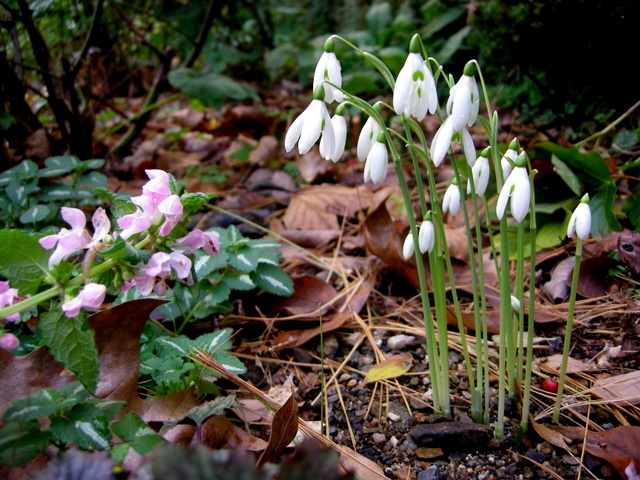 Galanthus reginae-olgae, a species snowdrop which has no handy common name, starts blooming in my garden in early to mid-October and continues for about four weeks. 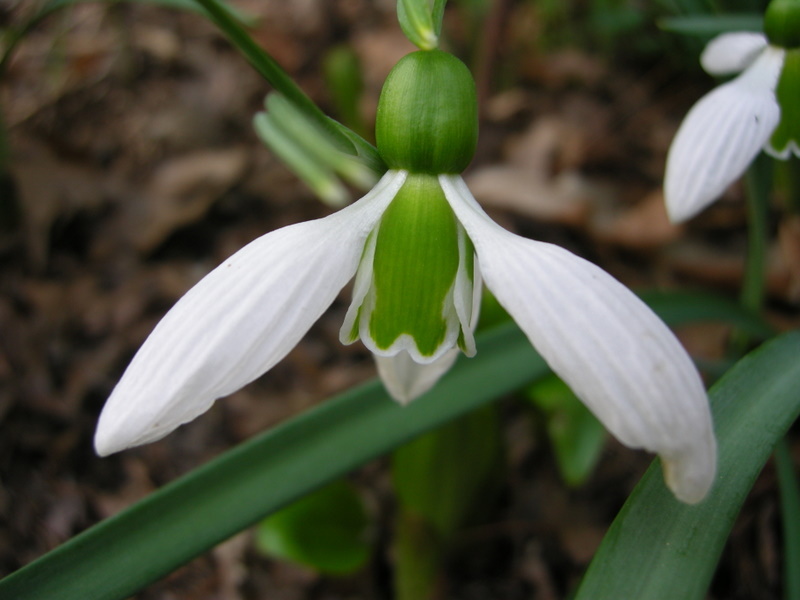 It looks very much like the common snowdrop, G. nivalis, with a single green spot on its inner petals. 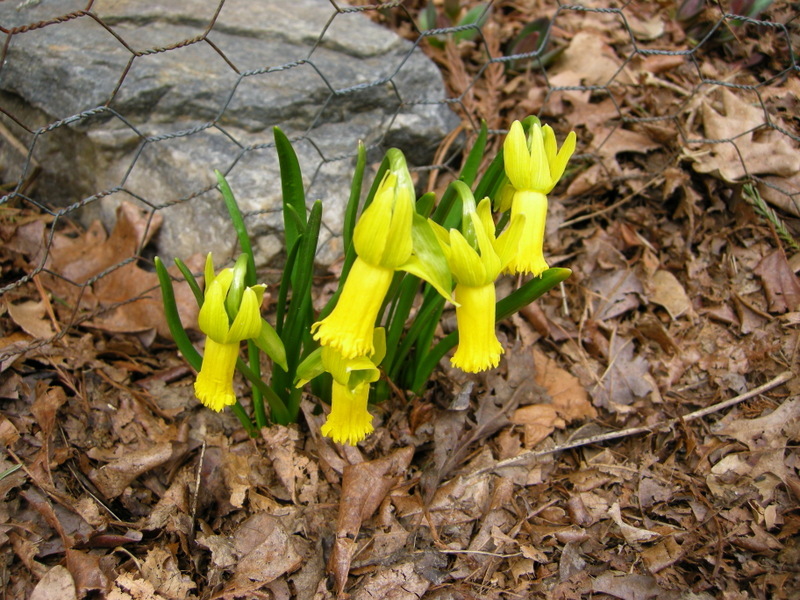 Its most significant identifying feature is its bloom time as it is the first species to flower in the garden. 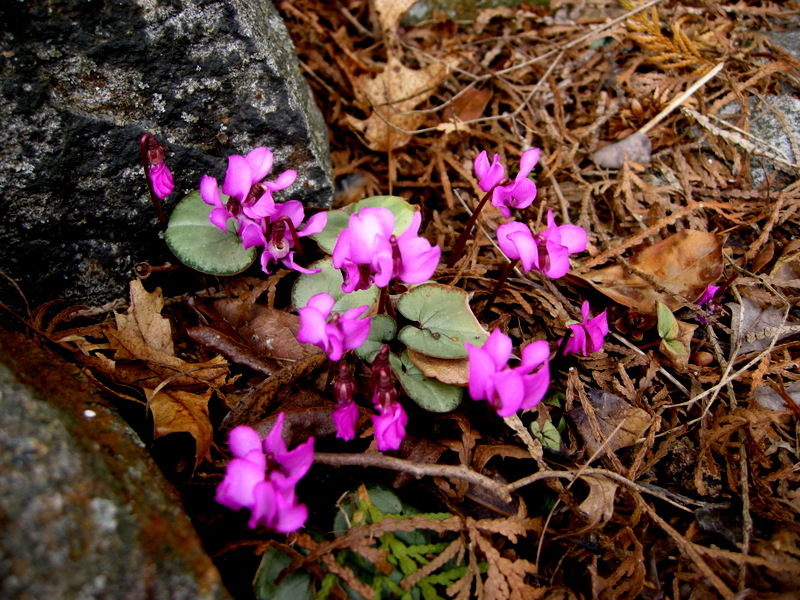 It is not particularly robust in my garden, but I love it in October. 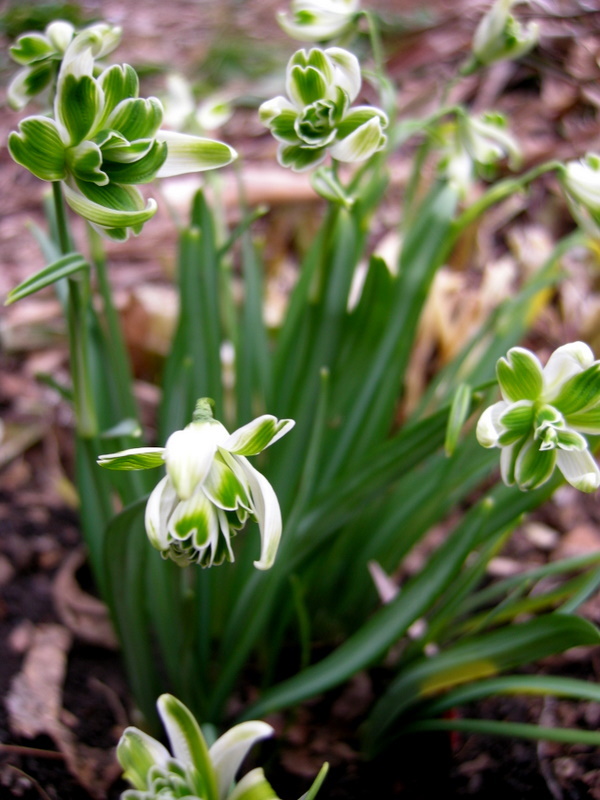 Just as G. reginae-olgae is winding down, the first blooms of Galanthus elwesii var. 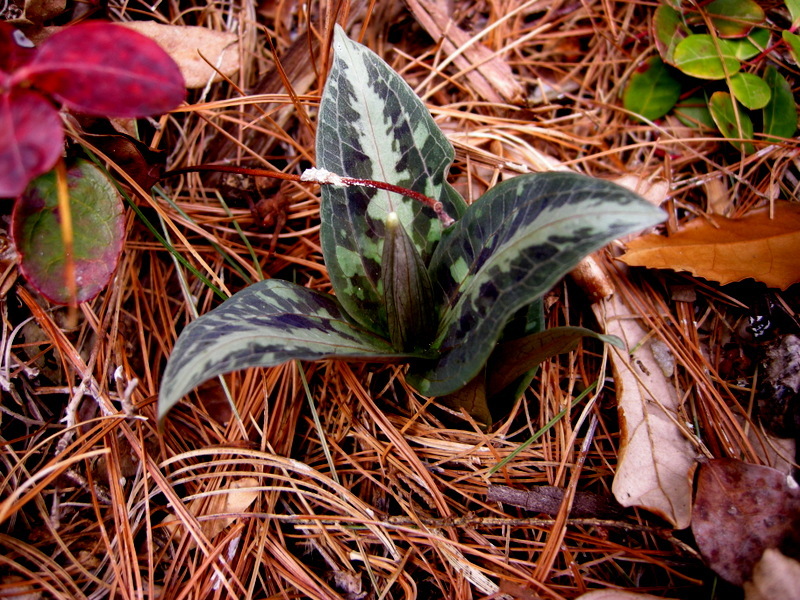 monostichus ‘Potter’s Prelude’ are opening in early November. It continues to flower, sometimes into January, when the straight species, G. elwesii, takes over. 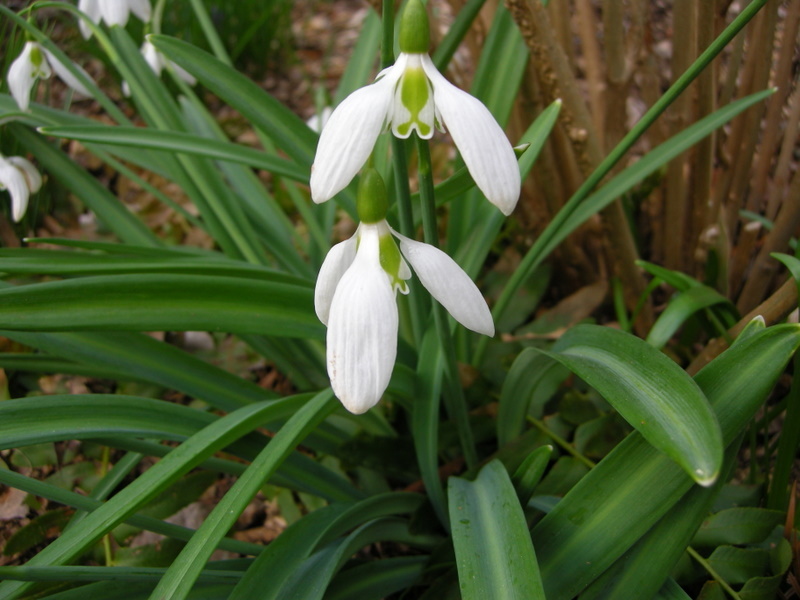 ‘Potter’s Prelude’ is a free-flowering and vigorous snowdrop in my garden with wide recurving blue-green leaves. 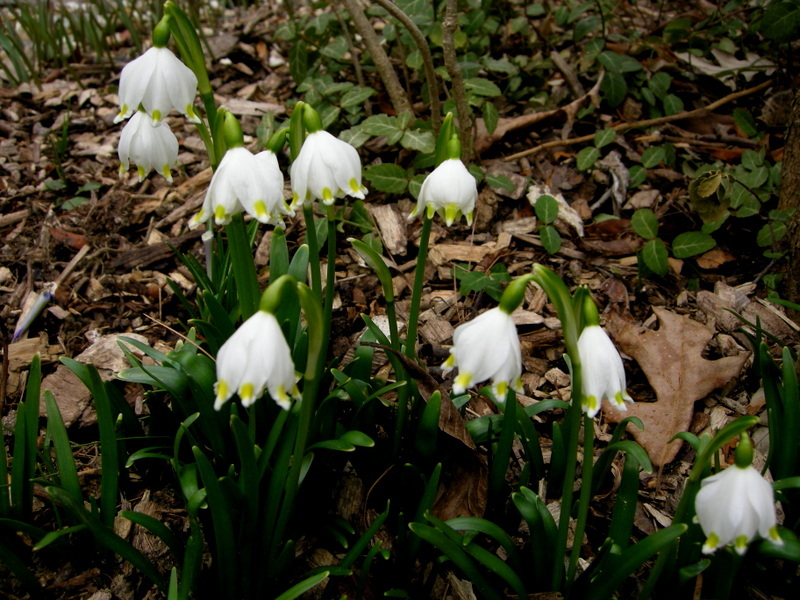 It has large blossoms equal in size to the best cultivars of the giant snowdrop, G. elwesii. 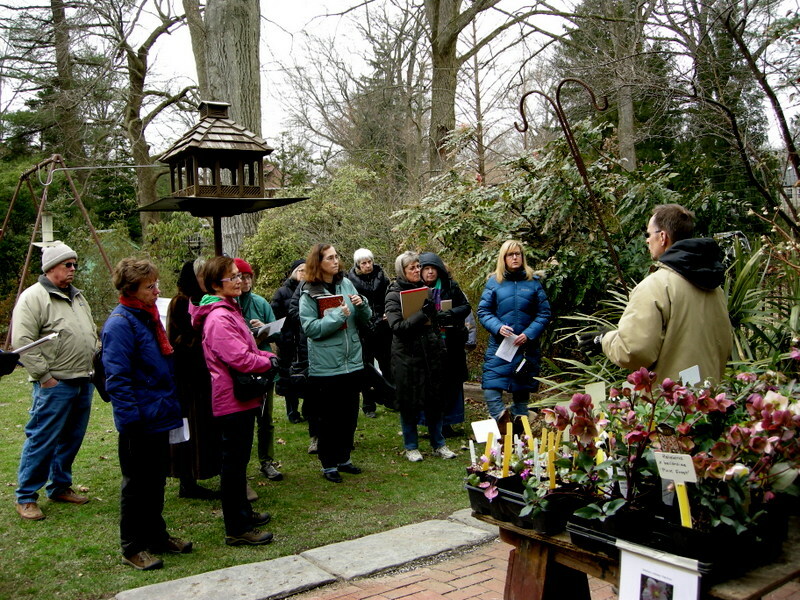 ‘Potter’s Prelude’ was selected by Jack Potter, former curator of the Scott Arboretum, and named and registered by Charles Cresson. 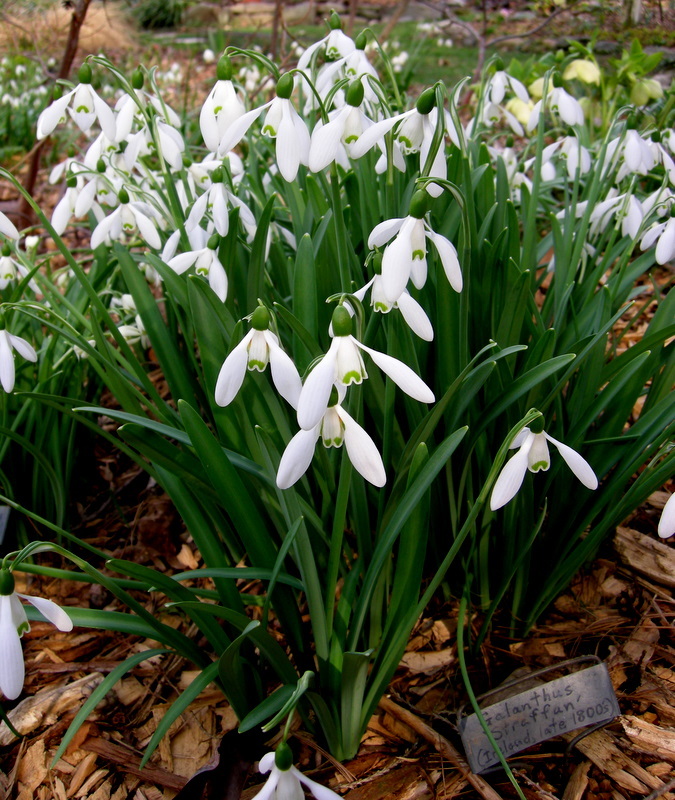 Charles has generously allowed me to include ‘Potter’s Prelude’ for sale in my February snowdrop catalogue and given me enough plants to enjoy good-sized clumps in late fall in my own garden.